People have been waiting for 04.11.08 unlock lately. However, even after iPhone 4S unlock, iPhone 4 04.11.08 unlock is nowhere in sight.Latest rumors says that new gevey sim won’t be available till iOS 5.1 is out, which means it will not be available till first week of march. We still don’t know how much longer this will take. There are no development in software unlock as well, Anyone claiming to have an unlock is fake. Hamzah Akram is very popular for his fake react0r unlock. For the impatient guys, there is a method available which can downgrade 04.11.08 baseband to 04.10.01 or 1.59.00. 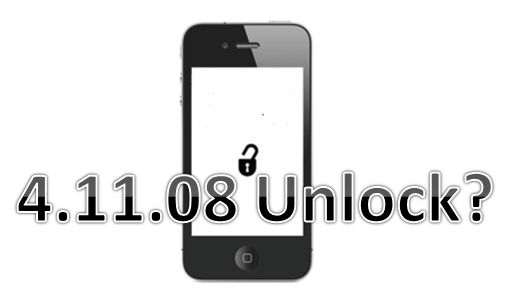 04.10.01 is unlockable via gevey sim while 1.59.00 can be unlocked via ultrasn0w. Unfortunately, the method is not software based, you’ll have to dismantle your iPhone 4, take out the logic board and send them to guys at beijingiphonerepair.com. Currently, this is the only way to downgrade baseband. All the tutorials claiming to downgrade baseband via special ipsw file, patched redsn0w or iOS 4.3.5 are either fake, or too old methods. technoNix.com would be updated as soon as new method for unlocking 04.11.08 is available. Keep checking technoNix.com or connect to us via email, @technoNix on Twitter or facebook fan page.